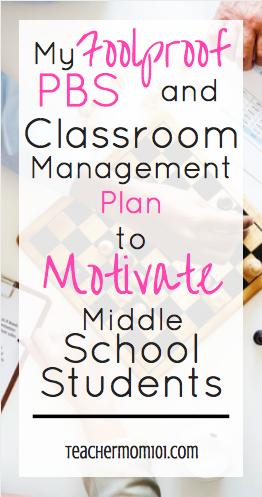 Like many teachers, I tried many classroom management plans that incorporated Positive Behavior Support (PBS), sometimes also called Positive Behavior Intervention Support (PBIS). My school is big on creating and keeping PBS plans throughout the year, so I tried a few different plans that included succinct lists of expectations and procedures and relevant consequences and rewards, but in the end, the plans got lost in the shuffle of a busy school year. Consistency is key when it comes to good classroom management, but because schools are such busy places, consistency can feel like a losing battle. So after a lot of trial and error and brainstorming, I created a classroom and PBS plan that has been fully effective with very little effort. This plan is easy to follow, easy to implement, easy for students to understand, and it puts accountability completely on the students. It also allows for more difficult students to have a fresh start every day, which we all know is important. This plan also hinges on big rewards. In order to motivate middle schoolers, the payoff has to seem "worth it" to them. Middle schoolers are not likely to work hard for an entire month for a 10-minute reward or dollar store prize. What I reward my students with is an entire PBS day at the end of each month where they can play board games, card games, color and draw, read books, and socialize. While an entire 90-minute spent on PBS period might seem like a lot of wasted or lost instructional time, consider this - if I lost 10 minutes of each day focusing on adhearance to procedures and expectations, redirecting behavior, and implementing consequences, I am losing 50 minutes per week, which over the course of an entire month can add up to be as much as 200 minutes. With this plan, I spend less time daily dealing with behavior, so those 90 minutes per month spent on PBS still amount to less lost instructional time overall. Plus, the prospect of earning an entire period of PBS time each month is crazy awesome for students, so it's really motivating. Each day, every student has 1 point that they earn simply by showing up. Their job is to keep that point. Their point can be lost by failing to follow expectations. The list is short and succicnt. Disruption, horseplay, not having completed homework, not following classroom procedures, and disrespect. Students get 1 warning that usually goes like this: "Sam, you are being disruptive, if it continues I will take your point." That is usually enough. Students typically say "no miss! I'm sorry!" and the disruption stops. If it doesn't, I take thier point for the day. Because students only get 1 point per day, they can only lose 1 point per day. 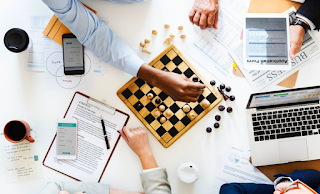 If poor decisions extend beyond losing their point then discipline becomes involved including phone calls home (what this looks like varys depending on the school). Students can also earn points too, which makes this plan so effective. 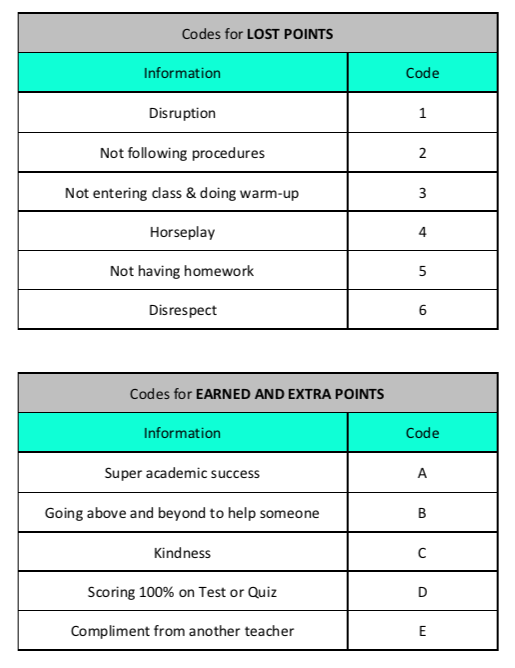 There is a list of things that students can to to earn points that includes doing something very kind or helpful for another student (above and beyond), getting a compliment from another teacher, getting 100% on a test or quiz, etc. Students can earn points throughout the month, so this can help to offset points lost if a student just had a bad week. This also encourages positive behavior! In order for a student to participate in the end-of-the-month PBS day, they must earn a certain percentage of points. I start the year at 70% and raise it throughout the year (this encourages positive behavior long-term). The number of points needed each month to have the correct percentage will vary depending on how many days in that month you have school. Throughout the month when students are beginning to lose points, I have the opportunity to pull them aside and discuss their behavior and explain that they are coming dangerously close to losing the PBS day. In order to keep track of points, I use a coding system and a chart for each month. If a student loses a point, I mark it in the chart with the code that corresponds to the problem behavior. If students earn points, I mark the chart with the corresponding code for earned points. I only mark the chart where students lose or gain points - a blank square in the chart means that the student kept their point that day. This is also helpful when I have conferences with parents, counselors, or students. I can refer to the chart and explain exactly what behavior was occuring on which days. This also allows me to show students exactly why they are unable to participate in PBS days if they lose too many points. It can be a great way to track behavior for students who are on behavior plans or who have IEP's that require behavior tracking. I am going to give you a copy of my behavior plan book for free! Each month has space for 25 school days and 25 students. There is a page that explains how the system works (if your school wants a written PBS plan), and a chart of codes for points lost or earned. I used my binding machine to bind all of this into a book, but you could use a binder or 3-prong folder as well. You can adapt this plan to match your school or classroom expectations! Download this document By Clicking Here!! If you have questions or need support in implementing this in your classroom, feel free to contact me via the comments section, or send me an email! If you do implement this, please let me know how it goes! I love hearing success stories from other classrooms! I really LOVE this way! I am a first year teacher at a middle school and we have the PBIS in place but it didn't work well for me. I love the whole point system it seems really easy/effective and easy/effective is what I am looking for. I have few questions: 1. where do I find that type of binding that you are have in your picture? 2. Where in your classroom do you keep your book while you are instructing? 3. If I have 6 classes how do you suggest I put my book together? 6 books or all in one and if all in one what would i do? 4. what do the other students do on those PBS fun days that didn't earn their %? 1. The binder that I have is called a GBC Pro Click binder and it's about $70 on Amazon. You can find it here: https://www.amazon.com/gp/product/B00006IAS3/ref=oh_aui_detailpage_o07_s01?ie=UTF8&psc=1 (not sponsored, this is just what I use) There are different sizes of binding that you can buy for this binder. It is well worth the money, I use it for everthing. I bought a cheap laminator also, so I laminate pages to make book covers so that it is sturdy. 2. I keep my book on my desk for easy access so if I need to mark a student for losing a point I can do it quickly. 3. I only have 3 classes, but I put them all in one book. I separated each class with a divider that I just made with cardstock and post-its. You could easily make these by using 3-prong folders, one for each class, and save yourself the expense of binding! 4. 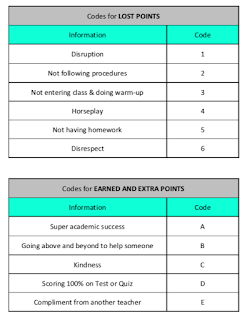 Students who do not earn enough points to have the PBS day go to another class and complete an assignment that includes a reflection sheet where they have to reflect on why they did not earn enough points, and how they can ensure to improve their behavior going forward. I make arrangements with other teachers beforehand, and if students get unruly during their stay in another class, they get sent to the discipline office. Great points system and I love that you code each positive or negative point so that you can really narrow in on each student's patterns. I love this idea, thank you for sharing. Just a couple of questions... How do you handle when students are absent? Did you find that a month was too long for a payoff? When a student is absent, I just put an X in the box for that date so I can keep track of absences. These don't count against them unless there is a situation where a student is skipping class. I haven't found that month is too long, and I wouldn't want to take up too much instructional time doing it more than once a month. The prospect of having an entrire 90 minute block to do whatever they want seems to really be effective. Especially after they get to have their first PBS day and they really see how worth it it is! Do your substitutes follow the same plan or is there another plan in place? I leave the book with the sub. It explains how the whole system works so they can use it. It's pretty simple to follow so I have never had a problem with the sub not being able to use it. Plus it gives good info. for me when I return on how my students behaved for the sub. What are the guidelines for the PBS day? During PBS days students have a few options - they can play board/card games (Uno is the most popular choice usually, followed by Jenga! ), they can color (I print coloring sheets), they can read a book, work on homework/make-up work for my class or other classes, or they can use their phone IF they have headphones. I have had minimal issues with kids following these rules because they are usually pretty stoked about PBS days. I also expected more kids to want to be on their phones, but they would much rather play Uno or Monopoly, which is great! Love this system, it's so simple and has a great, easy incentive for kids. Do you allow students to earn back a point in the same day if they already lost it? For example, maybe a kid is involved in horseplay (down to a zero for the day), but then later in the same class period goes above and beyond to help another classmate (back up to a 1 for the day). Thanks for your help! Yes! I allow students to earn points back at any time. The catch is that they can only LOSE 1 point per day. I think that for more difficult students, this is effective because they can only "screw up" SO much, if that makes sense, and they can easily redeem themselves. I'm sorry if I missed this in your post or in one of the comments, but what do the students who didn't earn enough points do during the reward time? If a student doesn't earn enough points, I work out arrangements with other teachers for that student to sit in another classroom for the class period. While there they do a short reflection activity and then I assign them something that they have to complete during that time. Hi, I think this is a great management plan, but how many points is a student allowed to earn a day for outstanding behavior, showing kindness, getting a 100 on a test, ect. Do your students earn than more than one for these codes? Is there a limit of earned points a day? Thanks I am planning on using this with my 6th graders! Students can earn unlimited points, but they can only lose 1. The benefit of this is that kids can never get so far in the hole that there isn’t a path back and every day is a fresh start. Thank you for creating and sharing this great plan for teachers. I am an Academic Coach at a middle school and this has been a god-sent plan working with many of our tough students. Thank you again. Hello! I've been sort of using this plan since pretty early on in the school year (first-year teacher, so I'm figuring things out as I go), but I'm starting to put it more in front of the kids, i.e. actually telling them how the points system works and what the codes are, as well as hopefully working in some version of the PBIS day. I have two questions. First, do the kids get to see how many points they have anywhere? Or do you just tell them if they're getting close to losing the PBIS day? Second, how do you deal with students who consistently lose their point and make no effort to earn it back during the class period? And then the next day do the same thing? Thanks so much! Kaily, thank you so much!!!! I have gone back to teaching Spanish after not teaching for about 20 years and have all grades, k-12. The middle schoolers have been my 'opportunity for growth' since the first day. I am looking forward to putting your point system into place with that group this week with the hope of starting off the second half of the year on a better foot in January--both for them and for me. Again, thank you so much! I am so glad to hear this! I hope that you have great success in the new year! January is a great time to reevaluate classroom management and start fresh. Good Luck! I think that those extra points are given out for the unexpected. I would tell students who do things like pick up a pencil or some other form of minor polite act that they are EXPECTED to do things like that. The extra points are for going above and beyond. 2nd year teacher here. Been looking for 2 years for a worthwhile positive reward system. Our school encourages PBIS. This is the first one that I actually want to try. I didn't want to hand out tickets or dollar store prizes. This is really fantastic.